Whether or not babies respond to their names by their first birthdays can be an important clue to whether or not they will end up with autism or other developmental delays, according to a MIND Institute study published in the April 2007 Archives of Pediatrics & Adolescent Medicine. Finding early ways to detect autism is important. This study focused on babies who were known to be at high risk for developing autism because they had an older sibling who had already been diagnosed. In the study, the researchers gave babies a small toy to play with while they were seated at a table, either in a parent’s lap or in a baby seat. Then the researcher moved out of sight, behind the child. When the child’s attention was clearly focused on the toy, the researcher called the child’s name in a normal voice. If the child disengaged attention from the toy, turned, and made eye contact with the stranger, he passed the test. If the child did not respond completely, the researcher called the child’s name again 3 seconds later. This was repeated a third time if there was still no response. In this small study, 75% of those that never responded ended up with a developmental delay diagnosed by age 2 (more than half of these with an autism spectrum disorder). By contrast, only 8% of those who did respond to their names ended up with an autism spectrum disorder. 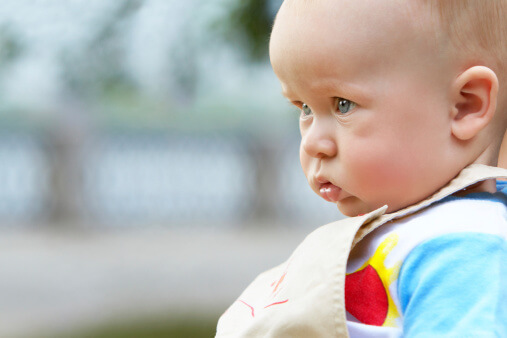 We’ve still got a lot to learn, but babies who don’t respond to their names by their first birthdays deserve careful consideration to look for developmental problems. By identifying and treating problems early, while the brain is developing so rapidly, we could make a big difference in kids’ lives. Do you worry about autism? Do you have a child who already has been diagnosed with an autism spectrum disorder? What did you first notice? What convinced you there was a problem? Please share. Let’s learn from each other.